All-Season Heating Jacket For The Woman On the Go. Join our waiting list to be notified when we launch. Thank you! We will contact you when the H1 Jacket is available for sale. From the Office Tundra, To The Winter That Never Ends, H1 Has Your Back. LOOMIA’s H1 heated jacket has 3 back heating sections, giving you warmth and comfort in any environment. Say goodbye to the arctic tundra of your office’s AC and say hello to warmth. The H1 Heated Jacket was designed to fit different body shapes and sizes. The tie belt keeps the jacket flattering and multiple double collar options means you stay comfortable while looking good in any environment. The custom connector and outside battery means you’re never fishing around inside your jacket to control the heating. Our LOOMIA Electronic Layer (LEL) provides subtle back heating that warms you up around the rib cage and the back neck. The H1 Heated Jacket is tech made simple. 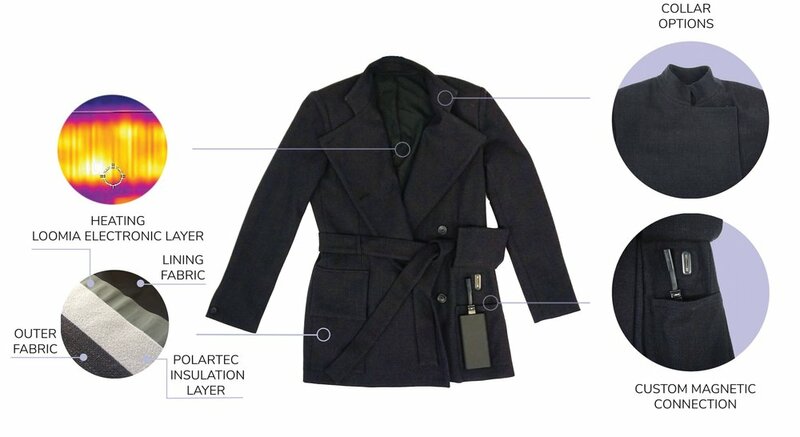 Each jacket has a phone-sized battery pack that fits into an outer pocket. The battery pack clicks into the jacket using magnets. Switch heating on and off using the adapter cable. We designed the H1 heated jacket to be a simple tech product, meaning it doesn’t require an app to work and is easy for anyone to control. The battery uses a magnetic adapter cable to connect to the jacket. We designed the battery to be in an outside pocket so it’s easy to access without opening the jacket. The magnetic connector attaches to the jacket with an easy ‘click’. Once it’s attached, the jacket is ready to heat. The on/off switch is on the adapter cable. Switch the jacket on or off using this control. The H1 Heated Jacket is powered by patented technology called the LOOMIA Electronic Layer, also known as the LEL. We spent three years conducting research and running production trials of the LEL tech to ensure manufacturability. The LEL is different from other heating technologies because it is completely wire-free. No wires means less opportunities for breakage, and opens up heating in slimline jackets. Our technology is produced in a ISO 9001 facility by Eastprint. Translation: the tech is made in a top-notch electronics factory to ensure safety and performance. The H1 Heated Jacket is manufactured by BF+DA with sustainable fabrics and Polartec lining fabric. When Will H1 be Available for Sale? We are looking to launch a pre-sale around fall 2020. Stay tunes for more updates! Absolutely! Email us at future@loomia.com to come by our office in Chinatown, Manhattan for a try-on session. Is it safe? The heating element has been FCC certified and will be CE certified before we ship. This means that the element will be held to rigorous safety and electrical standards before shipping. How heavy is the battery? The battery is a similar weight to a cell phone. What is the fabric made of? The jacket shell fabric is a wool blend and the lining is a Polartec custom blend. How do I clean the jacket? Because of the wool blend, the jacket may be limited to spot cleaning. we are currently sourcing additional fabric options to enable machine washing for the jacket. The jacket is designed to fit women of all shapes and sizes, so we recommend ordering slightly larger as it can be belted to fit. Why are you doing this? 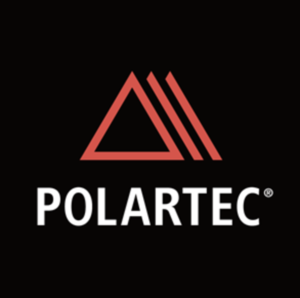 We are normally a B2B, behind the scenes company and we’ve spent the past three years conducting research and development on our own soft circuit system. Now that it’s ready for the market, we want to show the performance of our product to customers first-hand!We are stepping in front of the curtain to make a limited run product that customers can buy straight from the source. What is your return policy? If you are unhappy with your jacket, you can return it in 7 days. No questions asked. After 7 days, we can only accept returns for electronic failures. How long does the battery last? 2 Hours. If you need more heat, you can always use a bigger battery. 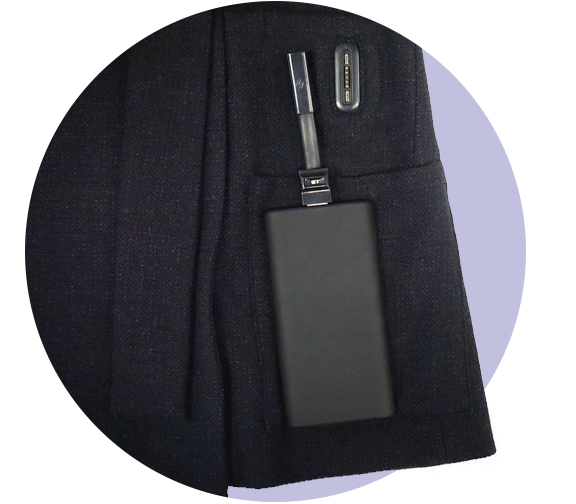 Our jacket works with any USB battery off the shelf outputting 2A and more. All good things come from collaboration. Special thanks to Marta and Mari for making H1 come to life.